The month of January is flying by, it’s unbelievable, and that means Valentine’s Day is around the corner. I’m personally not a huge fan of Valentine’s Day, never have been. Is that normal for a girl? I’m like the girl in the movie Valentine’s Day that throws an I Hate Valentine’s Day party every year. I can’t explain it, but I’ve never cared for it. I have the sweetest husband ever, so that isn’t the reason. My husband and I actually have an unspoken deal. We don’t buy each other gifts, ever. Not for Christmas, not for Birthdays, and certainly not for Valentine’s Day. We love each other and that is enough <3! So where am I going with all of this? I realize that I’m not the typical female when it comes to Valentine’s Day and many people L-O-V-E this day, so I made a set of I have…Who has… cards as my gift to you! The third and last classroom party for the year is coming up and this game is loved by many, so why not share the love? 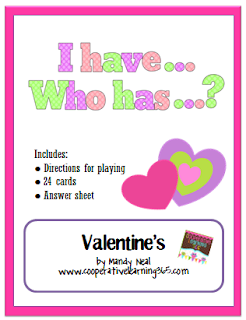 You can download this HERE freebie in my TpT store!